on four touchdowns Friday. Photo LJWorld. The Firebirds got up early on an eight-yard touchdown pass from Bryce Torneden to Tye Carter to go up 7-0 in the first quarter. Early in the second quarter, Free State scored again on a 55-yard pass from Torneden to Joel Spain to push the lead to 14-0. Free State made it 21-0 when Torneden found Carter on a five-yard touchdown pass at the 6:32 mark in the second quarter. Manhattan stayed alive when just before the half when Eric Prockish connected on a 16-yard touchdown pass to Keadrian McDonald. The score came with 14 seconds left in the half and made things 21-7, Free State, at the intermission. The Indians had a solid start to the second half, scoring on a 46-yard touchdown pass from Prockish to Jake Olson to cut the lead to seven. Free State was able to answer with a 19-yard touchdown run from Torneden, to bump the lead to 28-14. 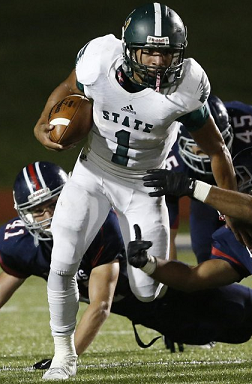 In the fourth quarter Khaury El-Amin scored on a nine-yard touchdown run to give Free State a 35-14 victory. A 42-point first quarter lead is about what we've come to expect from the Lancers against inferior competition. The scoring began with a 32-yard touchdown run from Sam Huffman. That was followed by three consecutive touchdowns pass from Gunnar Englund. The first went 21 yards to Sky Tate, the second 36 yards to Alex Dean and the third was a 31-yard pass to Jackson Gossick. 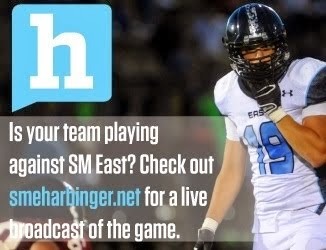 SM East's fifth touchdown of the first quarter came on a nine-yard run from Jack Tyler. Englund found Carl Young on a 39-yard touchdown pass to make the game 42-0 in the second quarter. Wyandotte finally scored on a 44-yard touchdown pass from Marlon Chinn to Jeffrice Wilson. The Lancers pulled back the troops, and scored just one second half touchdown on a 64-yard fumble return for a touchdown by John Aliber. Wyandotte's final touchdown came on a 56-yard pass from Chinn to Steven Ford. This proved to be the most competitive game of week eight around the league. SM West scored first on an eight-yard interception return for a touchdown by Asher Goldston. SM South came back with 10 points in the first quarter -- a 44-yard touchdown pass from Matt Hollingsworth to Brendan Brooks, and a 26-yard field goal from Cody Corbin -- before SM West evened things with a field goal from Tyler Thayer. Next, SM South went up 17-10 on a Dalton Lewallen run of five yards. SM West's Isaiah Macklin returned the ensuing kickoff 84 yards for a touchdown, before the Vikings added another touchdown on a 32-yard touchdown pass from Adam Rellihan to Isreal Watson to give SM West a 24-17 edge. SM South added a Marshall Bland touchdown run of 37 yards in the third quarter, but a missed PAT kept them down a point, at 24-23. SM West added the game's final points on a second field goal from Thayer. SM Northwest is accustomed to shootouts (they beat SM North 34-32 on a last second field goal a month ago), but this time around they weren't able to come out on top. Sam Sullivan started the scoring with a 36-yard touchdown run to give the Cougs a 7-0 lead. BV North's Joey Dolan then found Josh Tederson on a 43-yard touchdown pass to tie the game at 7. Sullivan came back with a 60-yard touchdown run to making things 14-7. But Dolan answered back himself, on a 15-yard touchdown run to tie the game up at 14. Next, BV North recorded a safety and went up 16-14. SM Northwest's Alex Quinn managed a 79-yard touchdown run to put the Cougs back up, at 21-16, early in the second quarter. Cooper Lantefield then scored on a three-yard touchdown run to give the Mustangs the edge, 24-21. Duron Lowe returned the ensuing kickoff 98 yards for a touchdown, which made the game 28-24 in SM Northwest's favor. Dolan answered with a six-yard touchdown run before halftime, which put BV North up 31-28 at the intermission. In the third quarter Lowe had a 75-yard touchdown run which gave SM Northwest their last lead of the game at 35-31. BV North scored a third quarter touchdown on a 16-yard pass from Dolan to Alex Blake, then iced the game with another touchdown pass from Dolan to Blake in the fourth quarter. Few saw this outcome coming. Blue Valley scored two touchdowns in each of the first three quarters, while also managing to become the first team all season to effectively slow down the Falcons in the first half. A 14-yard touchdown run from AJ Totta, followed by a 21-yard touchdown run from Williams Evans gave the Tigers a 13-0 first quarter lead. In the second quarter they added touchdowns runs from Evans and quarterback Colton McCumber to take a 28-0 lead to halftime. The third quarter saw touchdowns runs from Totta and McCumber to push the lead to 42-0. In the fourth quarter the Tigers added an 11-yard touchdown run from Evans to coast to the 49-0 victory. Olathe North had no trouble against Lawrence's physicality, and really seemed to thrive in the smashmouth type of game. The Eagles scored two first half touchdowns on a 64-yard punt return for a touchdown by Venus Triplett, and then a two-yard touchdown run from Triplett. They took a 14-0 lead to halftime. In the third quarter Olathe North added a 34-yard touchdown pass from Cole Murphy to Mark Keeling to go up 21-0. The Eagles' final score came in the fourth quarter on a 23-yard touchdown run from Isaiah Simmons. No box score was reported. The Pioneers clinched a second playoff berth in as many years with the victory. Sanchez Williams had 11 carries for 131 yards and two touchdowns, and Isaiah Ross added another two touchdowns himself. No box score was reported. Olathe East dropped their fourth game in a row, and was eliminated from playoff contention with this loss. Olathe Northwest kept their playoff hopes alive, while defeating Olathe East for the first time in school history. No box score was reported. SM North won their second consecutive game, and pushed their record to 2-6 with the solid outing against now 0-8 Harmon. Olathe Eagles do it again! ON defense has done it again! They have been Unstopable this year!!! !